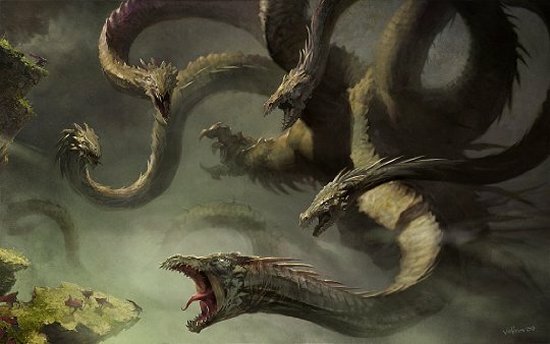 "Heroes and Monsters battle fearlessly in this magical land"
The Hydra – a hundred-headed reptile whose teeth contain the most deadly poison on earth. Tricked by a jealous goddess, Hercules must face the Hydra in battle – a fierce struggle that unexpectedly places the valiant warrior’s fate in the hands of a cunning young girl. First, however, Hercules must tangle with another powerful foe – Boreas, the brutal Titan of the North Wind. The Titan’s one weakness is his love for Iris, the Goddess of the Rainbow. When Iris shuns him, Boreas kidnaps her and takes her to his ice castle, which is guarded by giant arctic owls, prowling polar bears and wolves, and deadly frost demons. Hercules must face each in turn, and finally Boreas himself, to rescue Iris. And this is only a prelude to his greatest test of all! Spiraling from happiness to sadness and round again, THE HYDRA brings to life a world in which good and evil are forever in the balance. Heroes and Monsters battle fearlessly in this magical land, but it is the spirit of a beautiful young girl that triumphs in the end.